Detroit duo Dale Earnhardt Jr. Jr. has annoyed plenty of people with their weird band name; the Hollywood Reporter called it sheer "stupidity." It's bothered me too, seemingly the mark of yet another hipster band trying to set themselves apart from being obscure, through total obscurity. DEJJ, however, is hardly just another hipster band. Think more party and way less pretentious. 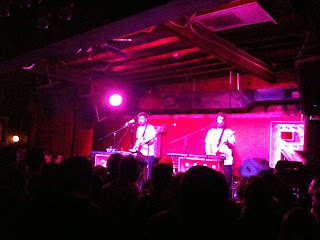 Their set at Red Palace on 9/22 was well worth the $12 ticket price. We've spotlighted DEJJ before, their somewhat retro remix of R&B and rock becoming a fast favorite for 2011. Their live show scored similarly well in our books. For their set at the Red Palace they rocked matching Detroit Tigers ensembles, their own band's tees, and for the encore, matching dayglow patchwork blazers emblazoned with "Jr, Jr" on the back. But outfits aren't all that they rocked. Bubbles and brightly-lit Jr, Jr signs set the stage for a full on dance party, electrifying the audience from one end of the setlist to the other. Highlights included We Almost Lost Detroit, and an encore with two of the finest performances of the evening: Simple Girl, and a cover of Whitney Houston's I Wanna Dance With Somebody (I kid you not). It took me entirely too long to post this review, but I'm glad I waited; after seeing a few shows from more seasoned artists the following week, I realized just how much I enjoy ones from bands on the way up. They don't wait until the sixth song to address the audience, or play songs just as they are on the album, or seem ungrateful in the slightest. They do so much more with so little (rich sound, awesome visuals, full-on energy, little name recognition) that nowadays it is incredibly difficult to justify paying a $40+ per ticket pricetag. All that is to say, next time DEJJ rolls into town, you should be there.